I like to paint small watercolors of colorful flowers and transparent glass filled with water. These small still-life paintings date back from the 90’s to the present 2016. They are all post card size 5.5”x 7.5”or smaller. I started off making this size in the mid-eighties to send as post cards. 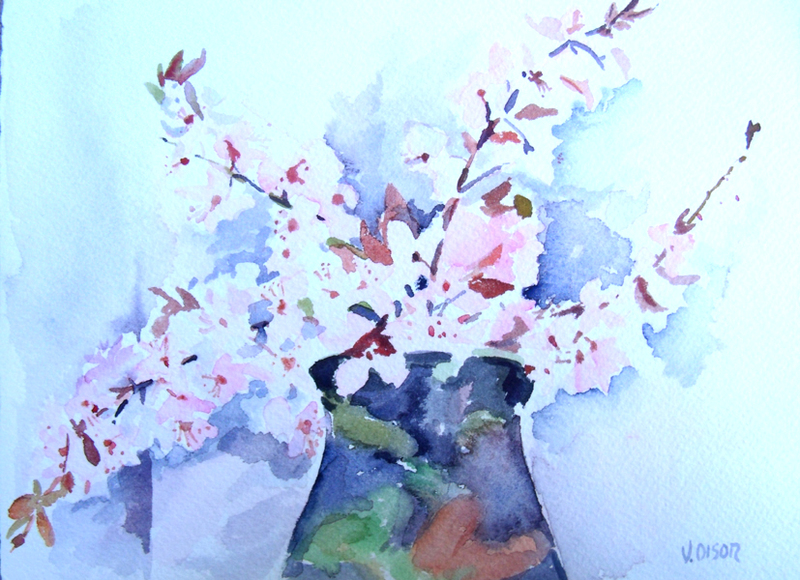 Almond Blossoms are really nice to paint. In the spring there are a lot of these trees in Madrid. I sent this watercolor to my Mom. When I go to California I see it on the wall. I remember visiting someone who had sweet peas growing in their vegetable garden, I couldn’t resist taking some home to paint them. I’m going to have to get some sweet pea seeds. The Red Bottle is one of my favorites. I bought it in the mid-eighties at the Salvation Army in the Gaslamp Quarter when I was living in sunny San Diego. I’m always on the look out for beautiful glass bottles and vases. This watercolor is wet on wet with my favorite red bottle. What I like the most about glass are the reflections; especially clear glass with water in it. I paint a lot; not everything turns out. It doesn’t matter. I like to include everything I see around my model. I go to California often, almost every year. I like to paint the flowers in my Mother’s garden. Bougainvillea is so fun to paint. Sometimes I paint the motif twice. Here I changed the vase. I like this vase; I like the fact that you can see the stems and leaves in the water. Here is the vase again with my Mom’s beautiful roses. I like colored glass. They have everything I like, color, shape, transparency and reflection. Someone gave me this vase. I think it’s beautiful with the vertical grooves imitating a greek column. This one got sent off in the mail. I like to do more than one painting to try a different view. When the spring comes around, I go a little crazy. I can’t stop painting. Spring is such a bright season full of color and warmth. You can really see the difference of the light in the spring. These are California Poppies and wild flowers. I brought the seeds from California and planted them here in Madrid. I recently sent this one to my Dad. I wanted to paint my model with the reflection in the mirror and on the table. This is the latest small watercolor. A friend told me that the color of this bottle is chartreuse. This entry was posted in Fine Art, glass, Interior Design, painting, Poppies, Roses, watercolor, Wild Flowers and tagged Fine Art, Glass Bottles, Interior Design, Madrid Spain, painting, Spanish Poppies, Victoria Olson O'Donnell, watercolor, White Flowers. Bookmark the permalink. I think the last one is my favorite; simple and beautiful. You do lovely work! Thank you Laura, yes simplicity is nice. It is amazing to me how these small pieces have so much detail. . The botles are surely your signature watercolor pieces par excelence along with the flowers. I love the text which tells more about the painting making it warmly personal. Chartreuse, yes! Such a beautiful color with the red flowers. Hi Penolope, I was sorting through the watercolors and noticed that I made a lot of small ones with flowers and vases so I put them all together and wrote a simple post. I imagine you know that you are the one who told me the name of the yellow bottle, haha. Thanks for your nice comments!